Raw Hire offer an extensive range of customised vehicles which can be built to client specifications for long term vehicle hire. Raw Hire ensures clients receive highest quality late models, resulting in projects being completed on time, on budget and safely. Servicing mining, resources, construction, civil and infrastructure projects, all specialty vehicles are site ready and will get you through the gate with all required safety equipment as standard. 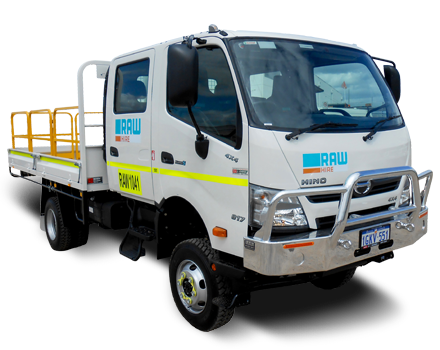 The Raw Hire range includes; water carts, tip trucks, large crane trucks, 4WD trucks and specialty trailers. 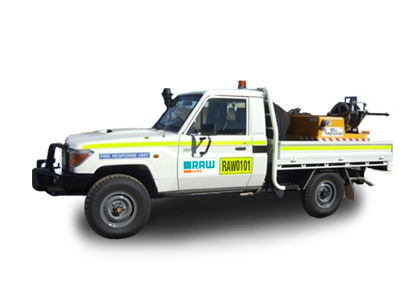 All specialty vehicles can be customised for long term vehicle hire and are available in Welshpool or Karratha, mobilised Australia wide. This designated fire response vehicle is typically used for firefighting and fire management. These units has greater access to restricted areas and are not limited to areas where trailers cannot access. Designed as a fast response vehicle for firefighting and fire patrols. For when you need to go anywhere there's the 4x4 Canter truck. This vehicle has high range four wheel drive gearing to give remarkable off-road capability, especially on slippery surfaces such as gravel and dirt making it the ideal truck for mining applications, pipeline projects and drill rig support.